Our contributors think the smart move is to stay far away from these three tech stocks. Most investors focus their energy on finding stocks they should buy, but sometimes it can be just as important to know which stocks should be avoided. That's especially true for tech stocks. This sector is always evolving, which puts companies that operate in the space at constant risk of being disrupted. If that happens to a company's business, the stock can go on to lose a lot of value in a short period of time. To help you weed out some of the bad stock ideas from the sector, we asked a team of Fools to share a tech stock they think should be avoided. Read on to see which companies they suggest keeping away from. 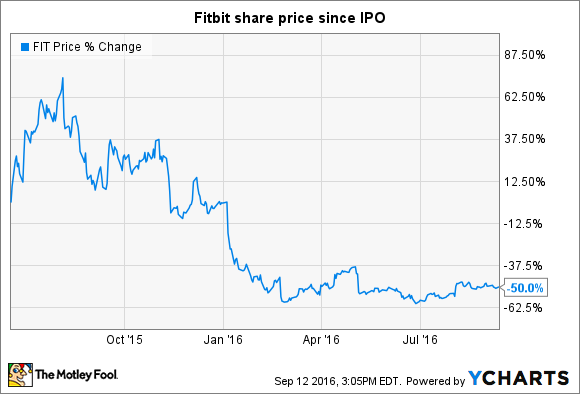 Brian Feroldi: History has shown that making a buck in the consumer electronic hardware space is exceedingly difficult, which is why I'd suggest steering clear of Fitbit (NASDAQ:FITB). Sure, this company helped to pioneer an industry that is primed for high growth in the year ahead, but I'm still having a hard time seeing how buying shares will work out favorably for investors over the long term. Why am I so bearish? I don't think consumers will ultimately pay a premium to just have the brand name "Fitbit" on their wearable device. After all, a simple search on Amazon shows that there are already a flood of copycat fitness trackers on the market that can be purchased on the cheap. It worries me that Fitbit will ultimately be forced into a race to the bottom on price in order to maintain its market share (and there are signs that this is already happening), which would spell doom for this company's long-term profitability. If that wasn't bad enough, there are also plenty of reasons to worry about the high end of the market, too. Apple just announced the launch of the Apple Watch series 2, which is water resistant and contains a built-in GPS. My hunch is this new device is going to be a big hit with consumers who are willing to pay a premium for a fitness tracker, which is going to put further pressure on Fitbit's business. For what it's worth, Wall Street is skeptical of this company's chances as well. Shares have only been publicly traded for slightly more than a year, yet investors who got in at the IPO are down more than 50%. Despite the carnage, I can't help but think there's more pain on the way in the years ahead, so Fitbit is one stock I certainly plan on avoiding. Keith Noonan: Nintendo (NASDAQOTH:NTDOY) stock is soaring thanks to excitement over the company's push into mobile development and initiatives to broaden the reach of its characters, but with its share price having nearly doubled year to date, I think it's probably best to avoid getting in at current prices. Nintendo's business is still largely built around controlling its own hardware and software ecosystem, and while the apparently fast-tracked embrace of mobile is probably a good sign, the famous video-game company is still very early in its transition to a new model, and its core business is not in good shape. Combined sales of its most recent handheld and home console hardware are more than 70% short of the combined sales of their predecessors, which has also meant a big drop in software revenues, and consistently lackluster performances for third-party publishers on Nintendo hardware suggest that the company's upcoming NX gaming platform could struggle to find support and continue the trend of erosion. Nintendo does have big opportunities in mobile, and its plans to transition its properties to film and feature its characters at Comcast's Universal parks also have potential, but there could be big risk in chasing the excitement. From a week before the release of Pokemon Go to the trading frenzy that followed the announcement of Super Mario Go, Nintendo's market cap increased from roughly $16 billion to roughly $35 billion, and it now sits at around $32 billion. The company has an undeniable history of releasing quality software and possesses the most valuable cast of characters in the industry, but it's facing big challenges in the traditional hardware and software space. Looking at the valuation bump in the context of the $5.9 billion price Activision Blizzard paid for mobile leader King Digital or the valuations of other mobile games companies gives reason for caution. Sean Williams: While it probably would have been a more prescient call eight years ago, my suggestion would be for tech investors to stop betting on a turnaround at smartphone and tablet developer BlackBerry (NYSE:BB) and avoid the stock at all costs. The story now is the same as it's been for five-plus years: BlackBerry's devices are struggling to compete against the Apples and Samsungs of the world. After blowing a commanding early lead in the smartphone market, BlackBerry found itself doomed by its own operating system, which proved far less favorable than either the Android OS or Apple iOS. BlackBerry has attempted to stage a comeback with the introduction of the Priv, a smartphone with a curved screen, slide-out keyboard, and BlackBerry's first foray into using the Android OS. The thought here was that if BlackBerry had its hallmark keyboard, but offered a more preferable OS, the consumer would latch on. In reality, that hasn't happened. In fact, in August, BlackBerry permanently slashed the $699 U.S. retail price on its smartphone by 28% because of weak demand. It's not been a total train wreck for BlackBerry; its software and services division continues to grow by double-digits. However, its mobility solutions division has been far and away so miserable that it's more than negating any positive impact from software sale improvements. BlackBerry has also done a good job of reducing its costs, but even then, cost-cutting alone isn't going to get the company back to sustained profits. Long story short, BlackBerry's future is murky at best. The company may wind up shuttering its once-powerful mobile division simply to stop the bleeding and rely on software sales to trudge forward. While this would be the most prudent path for BlackBerry, it could also mean plenty of bumps in the road still to come for investors.